Lately we’ve been trying to get a little more creative with the things we make here. After I mixed the honey-rice vinegar marinade (inspired by the ingredients list from a package of gari), I tasted it and thought it tasted just like lemon tea with honey. So what goes better with those flavors than… green tea! But once we tried it, the roll was good, but… missing something. What to add, to give it the oomph it needed? A few days before I had tried the combination of cucumber slices dipped in shoyu. It’s a fantastic combination. Kind of like salt with cucumbers (I’ve eaten that as a snack… do you too? ), except better. Turns out, that was exactly what this roll needed to make it just right. Mix the rice vinegar and honey until the honey is mostly integrated into the vinegar. Marinate the tilapia in this mixture for at least 30 minutes. Mix the sour cream and powdered green tea. Marinate the cucumber sticks in the shoyu for a few minutes. 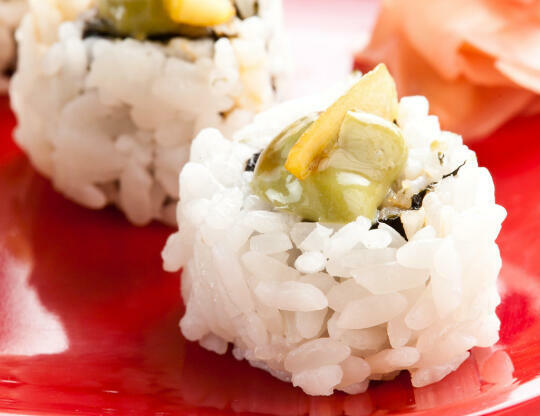 Roll the sushi inside-out, using the marinated tilapia as the filling. 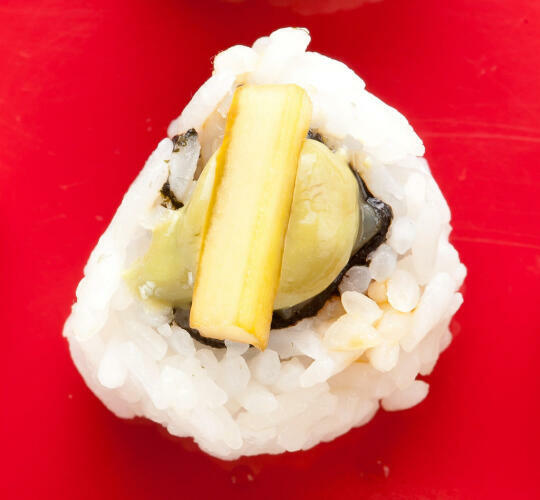 After slicing the sushi, top each with a dollop of the green tea sour cream and a shoyu-cucumber stick. truly sushi day is the sushi of today.